The salt you put into your product will have a big impact on what happens when your customers take their first bite or sip. Will they be delighted by the flavorful taste of sea salt on their tongues? Secret Sun® Sea Salts include a wide selection of natural, food grade sea salt options that will deliver full flavor to meats, cheeses, breads, sauces, soups, chips, and so much more. Our pure, organic (optional with alternate anticaking agent) salts are perfect for natural food products, and our popular low sodium varieties help you address the heart health concerns of your customers. 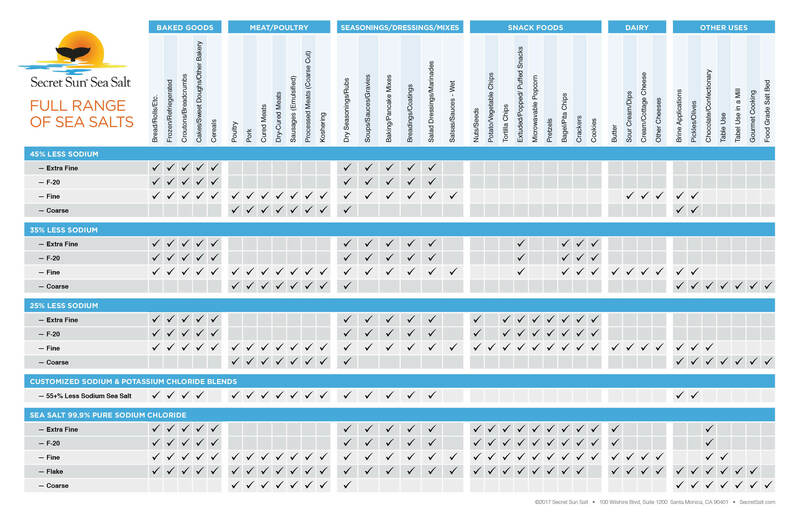 View our full product application chart below and choose the sodium content and salt grind that will help your product stand out from the competition. 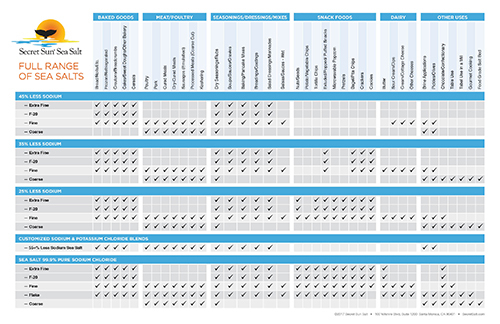 Click here to download the 11″ x 17″ PDF chart. Click on the links below to learn more information about Sun Harvest Salt’s product line and download PDF spec sheets for each. Contact us for additional product questions. If you don’t see the exact sea salt combination that you want give us a call today. We may be able to create a customized sea salt to meet your specific salt needs. Use the links below to find out more about why our salt stands apart.